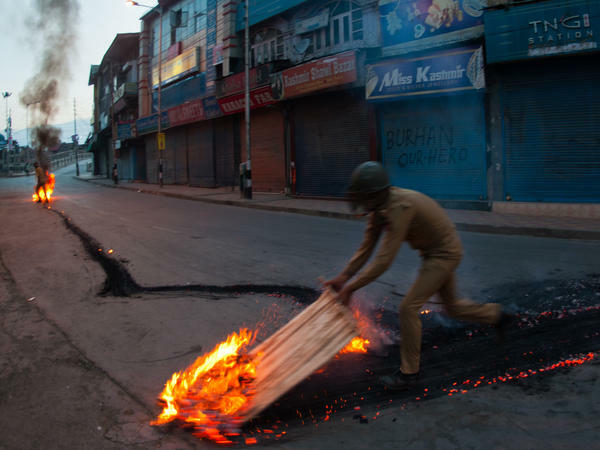 Indian government forces douse a burning tire left by protesters in the Kashmiri city of Srinagar. Violence has swept through the disputed region since separatist rebel Burhan Wani was killed by the Indian army on Friday. At least 25 people have died in clashes between militants and the Indian Army in the Himalayan region of Kashmir since Friday, according to the Associated Press. Most of those killed were protesters, who took to the streets after the death of Burhan Wani, the young and charismatic leader of the region's largest rebel militia, Hizbul Mujahideen. Wani was killed by Indian security forces in a shootout on Friday, according to the AP. The group has fought against Indian rule since the 1990s, and Wani was known for using social media to promote the group's ideology and attract the attention of young people who have grown up with hundreds of thousands of Indian troops deployed around them, according to the BBC. Wani himself was in his early twenties. "Wani was extremely active on social media and, unlike militants in the past, did not hide his identity. "His video messages, which would often go viral in Kashmir, were on the topics of Indian injustice, and the need for young people to stand up to oppression. "Indian officials have said that he was instrumental in persuading local boys to take up arms." The Associated Press reports that thousands of mourners joined a funeral procession for Wani Monday in his hometown of Tral, chanting and carrying his body through the streets. Indian and Pakistani media coverage has reflected decades of divisions over the status of the region. In its coverage of the violence, The Times of India has called Wani a terrorist. The Times of Islamabad refers to him as a martyr. The Pakistani and Indian governments, which each administer a portion of the region but which both claim authority over all of Kashmir, have weighed in on the violence. Indian Police Inspector-General Syed Javaid Mujtaba Gillani told the AP that Wani's death is the "biggest success against militants" in recent years, and the wire service reports that Pakistani Foreign Secretary Aizaz Ahmad Chaudhry released a statement questioning whether the use of force against civilians in Kashmir amounted to a human rights violation by Indian security forces.